The Museums of Port Isabel invites you to celebrate Mardi Gras at their 14th Annual Fundraiser on February 11, 2011 from 7 – 10 p.m. The evening will feature lots of great food and drink, a festive Mardi Gras atmosphere and live entertainment. Through out the evening items featured in the Silent Auction will be on display in the museum. Tickets are available now and are $50 per person. All funds raised contribute to the preservation of the history of the Laguna Madre area and are tax deductible. 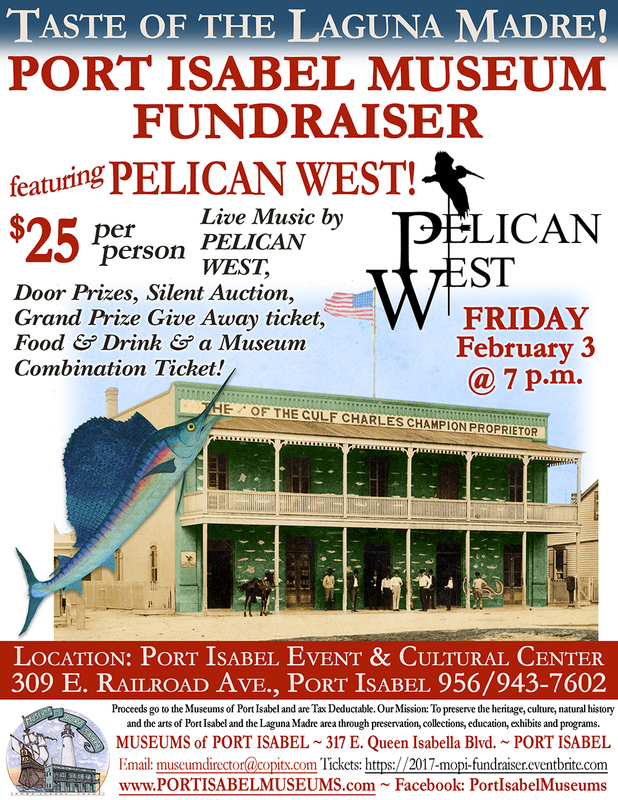 This is the Museums of Port Isabel primary annual fundraiser. Tickets are $50.00 each and include access to all the evening's activities including food, drink, entertainment and silent auction. Proceeds go to preserve and promote the history of the Laguna Madre area and ticket costs are tax deductible. Filling out the form below will reserve your tickets. You will be contacted to finalize payment. If you have any questions, please call 956/943-7602. Live Music by: The Frontera Jazz Quartet will be performing at the Museums of Port Isabel Annual Fundraiser on Friday, February 11, 2011 from 7-10. The Frontera Jazz Quartet, or FJQ for short, has been performing in the RGV, Mexico, and across Texas since December 2006, including at the Texas Jazz Festival in Corpus Christi (2007-2010), The Brownsville Latin Jazz Festival (2007-2010), The SPI International Music Festival (2008, 2009), the Elephant Room in Austin, TX, The Irish Pub in Matamoros, the US Consulate in Matamoros, and many other festivals, private events, clubs, and restaurants. We are extremely honored to have this group be apart of our event. Going with the Madi Gras theme, Clay Moore who heads the Frontera Jazz Quartet has a special Madi Gras flavor that will be added to the music. Clay has opened for many internationally-known artists including Bill Frisell, Eric Johnson, Spyro Gyra, and Chuck Mangione. For more information on ticket sales, silent auction donation, or sponsorship contact Jeannie Marie A. Flores at 956/943-7602 or email museumdirector@copitx.com. Participating Food & Beverages: White Sands Restaurant, Reyes Seafood, Marcello’s Restaurant, L & F Distributors, Costa del Mar, Pirates Landing, Valerie Godines, Manuel’s Restaurant, Mary Gorball, H. E. B.